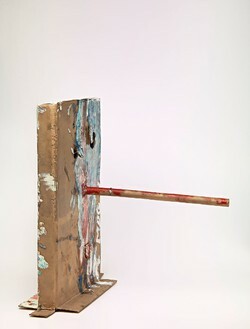 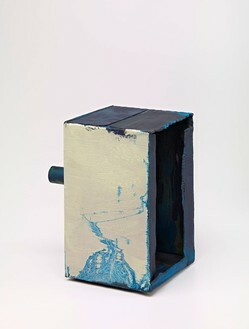 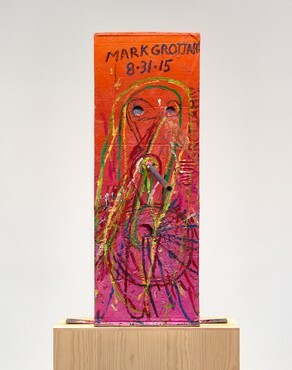 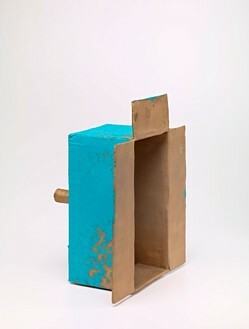 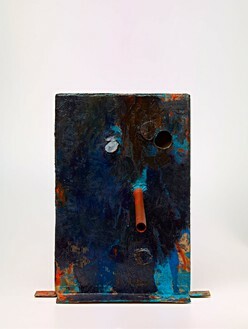 Gagosian is pleased to present Mark Grotjahn’s first exhibition of painted bronze sculptures. 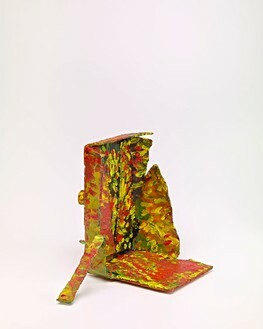 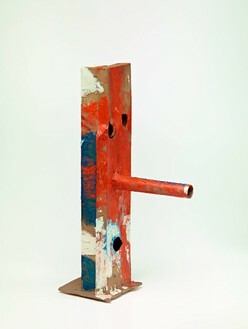 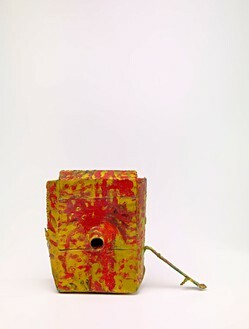 Grotjahn’s Mask sculptures are deceptive. 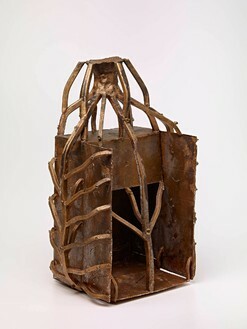 Cast in bronze from spontaneous cardboard assemblages that he has been working on privately for over a decade, they record all the nuances of the original found material with its corrugations, dents, tears, and creases. 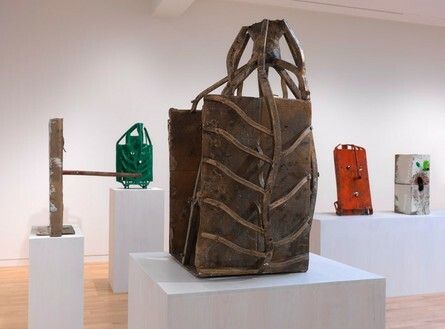 Each original cardboard form—taller, deeper, flatter, or roughly cut away—spawns up to eight bronze casts, produced according to the lost-mold casting method. 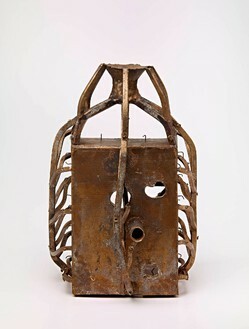 (In some instances, Grotjahn has even retained the channels that transport the molten metal into the slip, transforming them into powerful formal elements.) 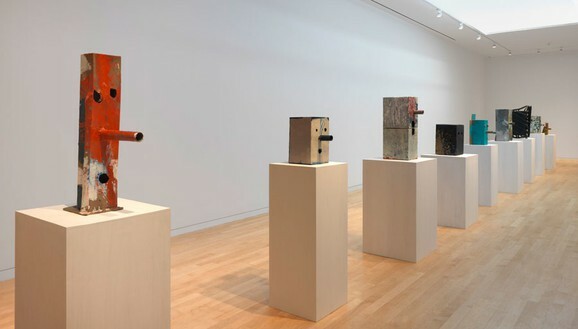 The bronzes are vigorously painted, often with the fingers, in a riotous spectrum of color—deep violet with green accents, puce, scarlet, emerald, turquoise, scumbles of pastel shades, sober or fiery tones. 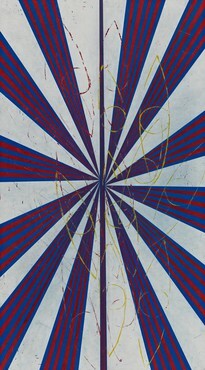 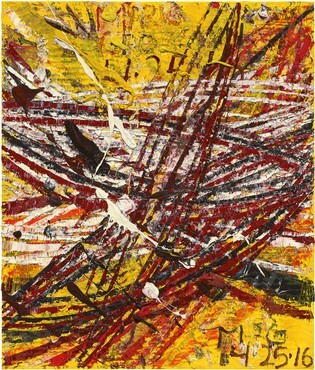 While many of them are expressively and compellingly rendered in abstract terms, others seem primarily to be supports for the fact of Grotjahn’s authorship, their surfaces covered by his erratically blocked signature or initials. 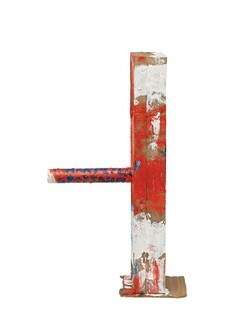 Most of them rest on pedestals, stubbornly sculptural, while a few are wall-mounted, referring directly to painting. 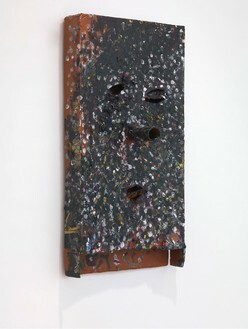 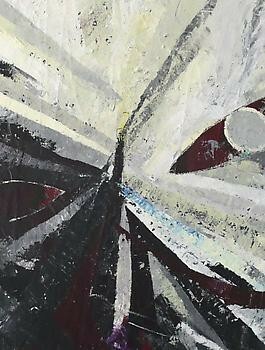 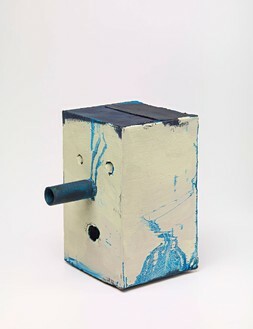 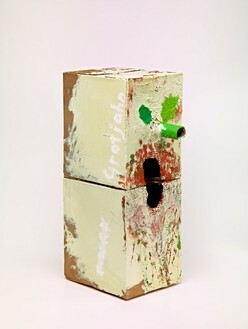 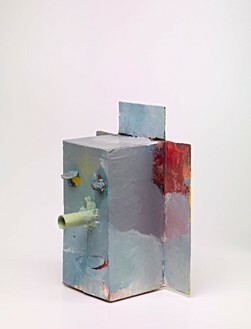 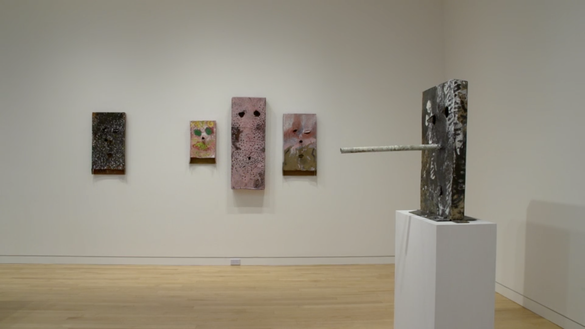 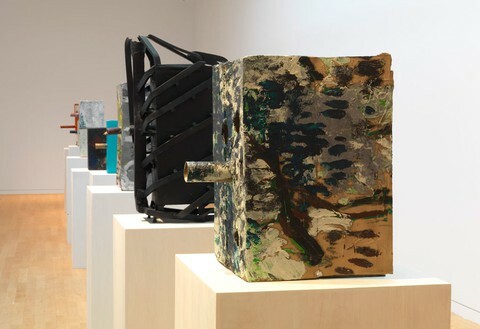 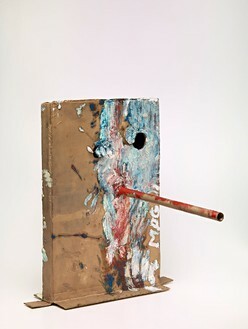 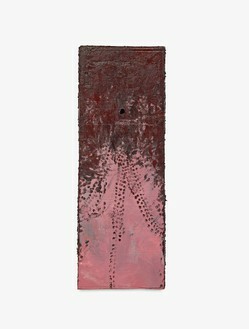 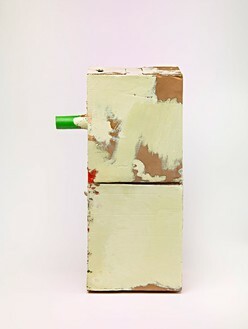 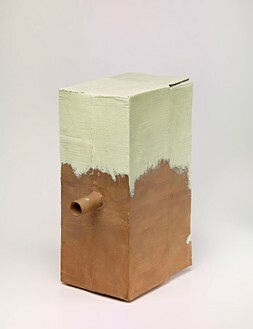 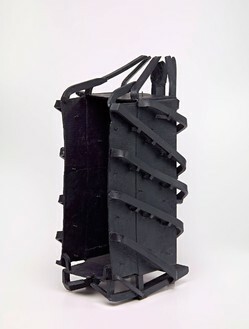 Specifically, they speak to Grotjahn’s contrasting bodies of work, the Face and the Butterfly paintings—the former with their elaborate textures and primitive style, their savage quality underscored by the cardboard on which they are painted; the latter with their densely layered and nuanced monochromes. 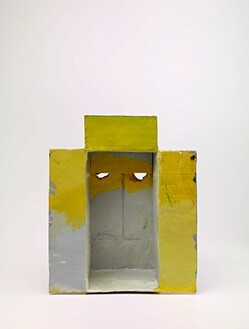 The Mask sculptures recall the simple cardboard box constructions typical of early classroom activity—emulated so charmingly by Picasso for his own children during the idyllic Mediterranean years—flat, square faces with holes for eyes, a tube for nose, and a slightly larger hole or slash for a mouth. 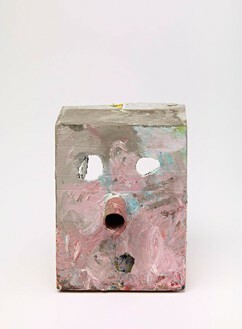 Sometimes the face is given just one of the three facial features. 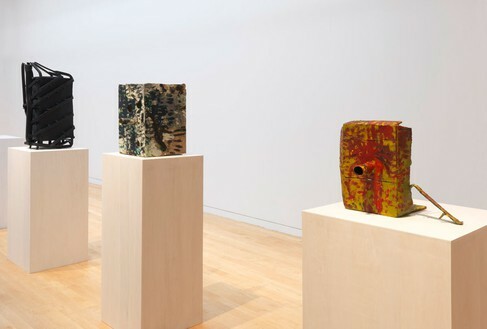 Replaying the inspirative relationship between the early modernists and the arts of Africa and Oceania, they also explore the obsession with surface initiated by the Tachists and Abstract Expressionists. 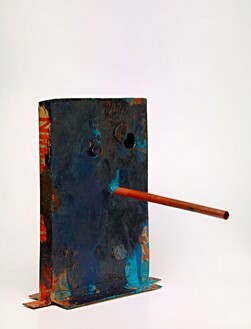 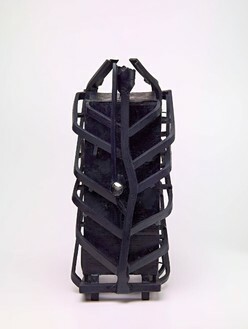 Like his predecessors, Grotjahn establishes an aesthetic remove from his referents via the processes of fabrication and production, thus his sculptures manifest both an undeniable primal intensity and a sophisticated yet endearing appeal.